I also have a zillion browser windows open at any given time (unless I've recently done a browser window purge, which is about once every couple of weeks). Many other things all around as well; emails, Finder windows, etc. I currently use the old-school system of not associating each display with its on space. 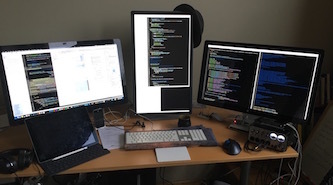 Not because I want to stretch windows across multiple monitors, which I don't really do much of, but because it allows me to group many windows together in a work environment across all the monitors. I have 10 spaces usually. Each major project gets its own space. When I go to that space, all the programming windows are there, across all displays, that are relevant to that project, including any relevant emails, browser windows just for that project, notes, text, etc. And when I switch to another window with a touch of a function key, a go from one complete work environment to another, seamlessly. There is no way to group display spaces to jump to them all at once. It's a complete mess when I want to go from one working environment to the next. I've tried to hack it with AppleScript or other means without success. So… what am I missing about how great the new* way is supposed to be? One last thing: Apple could give me what I need in the new* space technique and I could have the best of both worlds if I was able to bring up a collection as a group, and then the user is on their own from there. It'd just be a convenience thing, but it would require just one extra bit of spice: Allow each space to be tagged and also to be called up via AppleScript or something more convenient via the Mission Control panel. How great would tagging be? I could imagine writing a script that not only brought up pdfs, etc, by tag, but then displayed them in a space just for that tag, either switch to such a space or creating it on the fly. One could do this all without chaos in an elegant fashion, but I'm guessing it'll never happen.